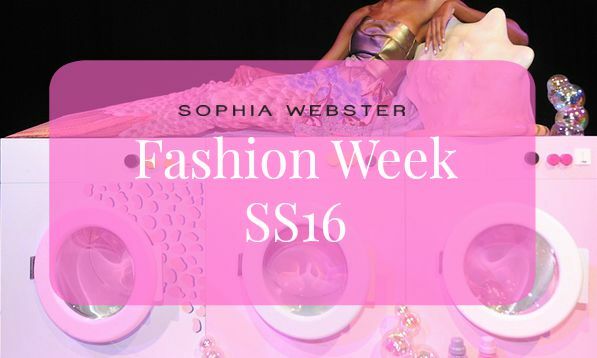 This season's quirky and elaborate theme for the presentation was a Mermaid Launderette, exactly as it sounds: a group of mermaids have laundered their tails - and hung them on a washing line across the space while they get their legs out for an hour or two and wear Sophia Webster shoes - i just feel bad for the mermaid who chose to use her time hanging out sat in a washing machine whilst wearing such a beautiful glittery pair of heels! As usual a beautifully thought-out setup, with pink washing machines, bubbles and giant boxes of detergent, scattered around showcasing the footwear and bag styles from the collection. While the shoes were amazing, i am not so sure on the models outfits, the swimsuits were cute but not so sure about the old school swim hats even if they were beautifully bedazzled. Although hanging out in a giant clam shell surrounded by shoes and giant pearls does look like fun. The perfect collection, with a mix of pastels and metallic with a hint of nautical thrown in for good measure. Featuring Webster's signature speech bubble styles updated to sit within this new assortment alongside some new silhouettes including a 70's platform and the daring thigh high fishnet sandals. 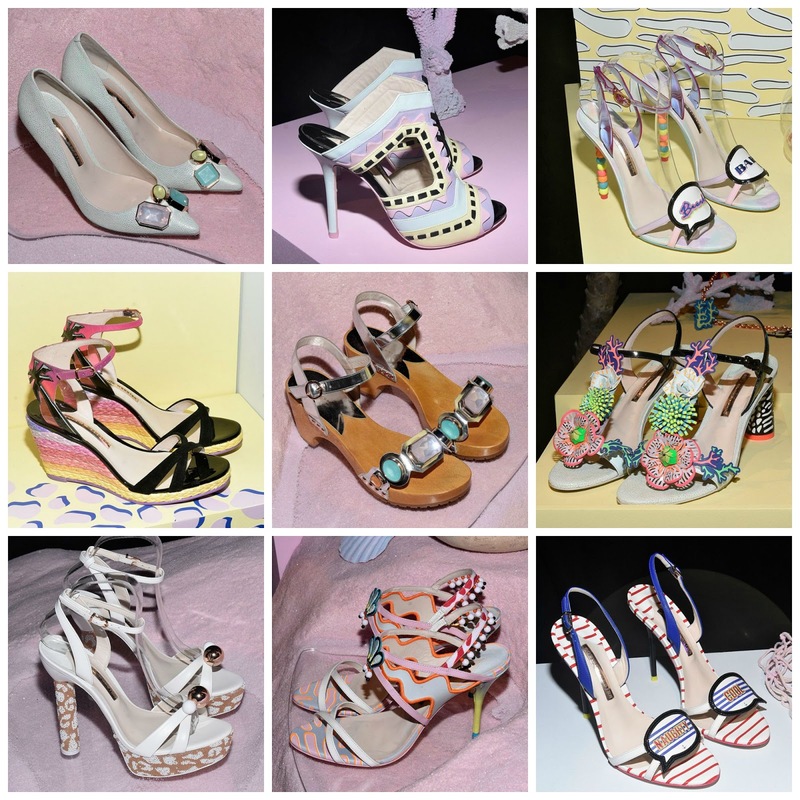 The above styles are my favourites from the presentation, with the pastel mules (top row second image) catching my eye first, i love the colours as well as the almost patchwork look of the uppers and the cutout detailing. 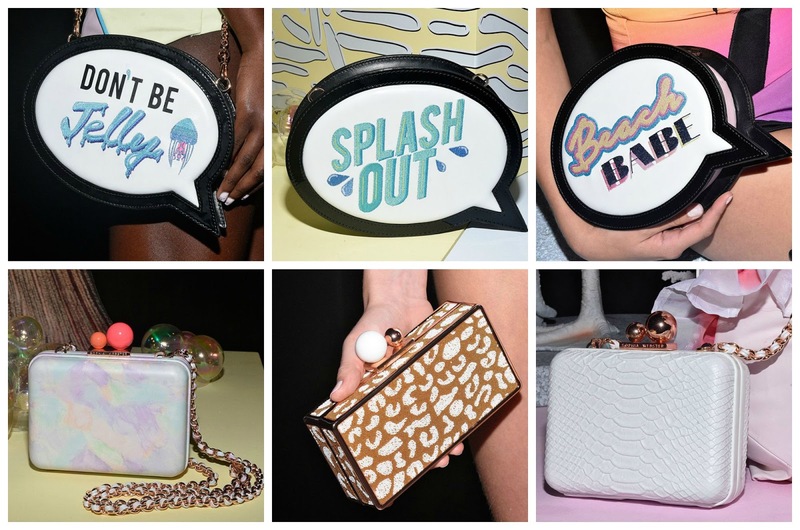 As expected the typical speech bubble clutch bags made an appearance with some cute mermaid slogans, as well as some beautiful new hard case clutches featuring prints and textures from the shoe collection. I especially liked the detail on these - favourite has to be the third image, a great pale blue shade and a gorgeous rose gold clasp and chain strap. By far my favourite element of any Sophia Webster collection, the Mini shoes are always so adorable and i just love the idea of mum and mini me. A small collection as always but super cute and perfect for any aspiring fashionista. Would you trade in your mermaid tail for a pair of these beauties? I certainly would..